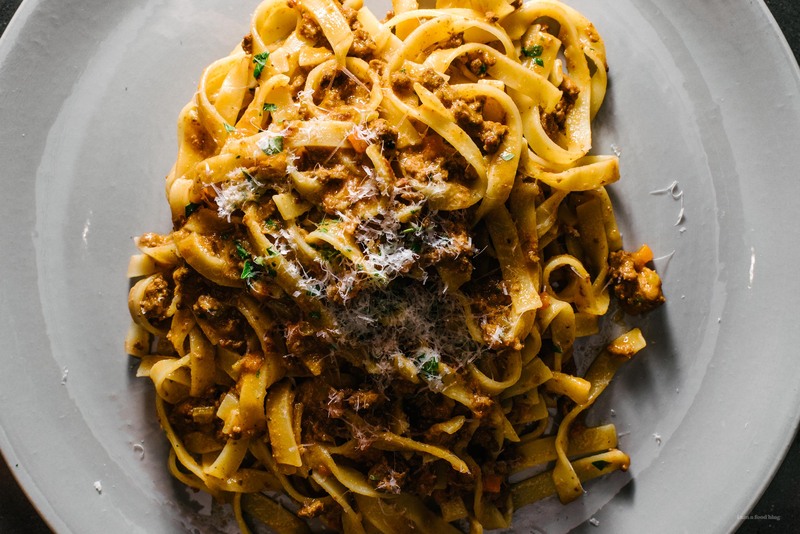 The ultimate bolognese, with a secret ingredient, or two! I’m a huge fan of bolognese sauce. So much so that Mike and I even went on a pilgrimage to Bologna. It was half in jest and half in complete and utter seriousness. I needed to taste bolognese sauce from Bologna. Somehow I got it in my head that it would be the ultimate bolognese. I was planning on stuffing my face, 6 times over, eating all of the sauce I could possibly handle. Alas, it wasn’t so, because, spoiler: it wasn’t everything I dreamed it would be. Don’t get me wrong, it was good, but it was missing something. And to be honest, I think that little something was that I was expecting it to taste like American bolognese, the kind that my non-existent Italian nonna in Little Italy in NYC would make on Sundays. 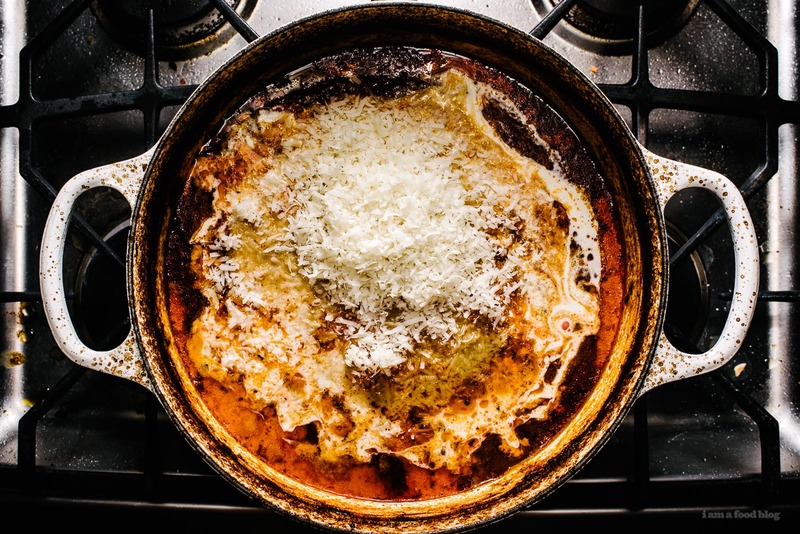 The kind that reminded me of family, all of us, spilling out of the kitchen, into the living room, and out on the stoop, holding of giant bowls of steaming pah-sta topped with Sunday gravy, held precariously in our laps, a snow shower of fluffy parmesan adding the final touch. In my dreams, the pot of sauce would be never ending and there would always be meatballs. Sadly, I don’t actually have any actual memories of Sunday sauce because that never happened, but part of me is forever searching for those cozy pasta feels. There’s something primal in me that just loves a good bowl of noodles. I’m always on the lookout for bolognese sauce recipes. I mean, often times, I’ll just wing it – after all, all good sauces start with the same base ingredients: soffrito (the holy trinity of onions, carrots, and celery), meat, stock, and tomatoes. For fun, I’ll do different combinations of meat, or alter the amount of tomato, sometimes going for a rich almost tomato-less gravy, sometimes opting for a very tomato heavy, meat-light version. All sauce is good sauce, especially when you’ve been smelling it bubble away all day, while visions of pasta twirl in your head. But while all sauce is good, there can only be one that is the best. Whenever something is labeled as “the best,” I take it with a big pinch of salt. The best is so subjective – even who you’re eating with can change the way you feel about what you’re eating. 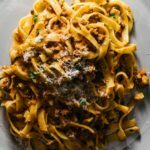 But, with that in mind, I set out to make the Kenji Lopez-Alt, of Serious Eats and The Food Lab fame, best slow-cooked bolognese. Kenji has a few tricks up his sleeve: using powdered gelatin to give the sauce a luxurious texture, stirring in blended chicken livers for an underlying earthy meatiness, and oven slow roasting for rich brown flavors and tender meat. He also stirs in cream and parmesan for a fully emulsified sauce. But, my favorite part of his recipe, and by no means any secret to me, is finishing with a healthy amount of fish sauce, which ups the umami and ties everything nicely together. This recipe makes a lot of sauce, but if you’re going to go for it, you’ve got to go all in! Invite a bunch of people over, or just plan on eating sauce for the next couple of days. 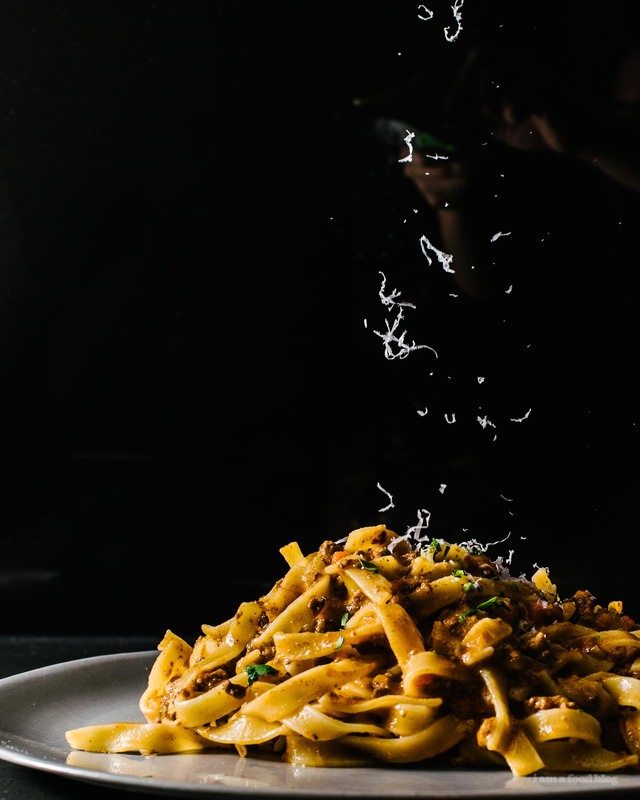 You could even freeze it for those times when you just need a hit of bolognese. Whatever you do, set aside a day to make sauce. It could be this recipe, or your own, whichever it is, I just know it will warm your soul. Adjust your oven racks (lower-middle position) so that a large dutch oven fits on the rack. Preheat the 300°F. Place the stock in a bowl and sprinkle with the gelatin and set aside. Puree the tomatoes with a blender or immersion blender until smooth. Set aside. Use the blender/immersion blender to blend the chicken livers until smooth. Set aside. Over high heat, heat the olive oil in a large dutch until hot and shimmery. Add the beef, pork, and lamb, and cook, breaking up with a wooden spoon or potato masher, until no longer pink, but not browned, about 10 minutes. Remove from the heat and stir in the blended chicken livers. In another pan or skilled, melt the butter over medium high heat. 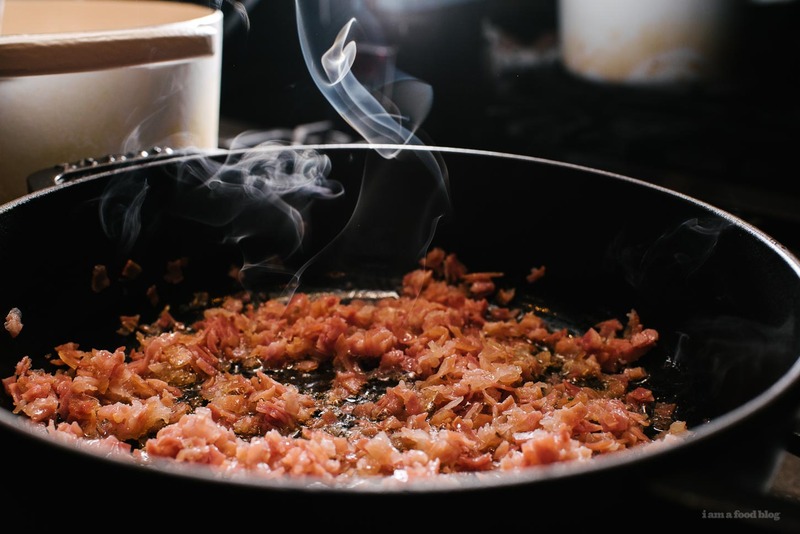 Add the pancetta and cook, stirring often, until the fat renders out of the pancetta, but it is not yet brown, about 8 minutes. Stir in the onion, carrots, celery, garlic, sage, and half of the parsley. Cook, stirring, until the vegetables are soft, but not brown, about 8 minutes. Stir the cooked vegetables into the dutch oven with the meat. Cook the meat and vegetable mixture over high heat, stirring, until most of the liquid evaporates, about 10 minutes. Add the wine and deglaze the pan, stirring, until the wine is mostly evaporated. Add the gelatinized stock, tomatoes, milk, and bay leaves. Season gently with salt and freshly ground pepper. Bring to a gentle simmer and place in the oven, uncovered, and cook, stirring occasionally, until the liquid is almost completely reduced and sauce is thick under a heavy layer of fat, about 3-4 hours. If the sauce is still thin after 3-4 hours, transfer to the stovetop and bring to a brisk simmer over medium high heat, stirring frequently. Skim off most of the fat, leaving about 1 cup behind, then stir in the cream, parmesan, fish sauce, and remaining parsley. Taste and season with salt and freshly ground pepper. Enjoy with your favorite pasta! But OMG, now that I have seen the different ingredients you tried, it sounds amazing! I’m going to have to give it a try next time. I made Bolognese sauce about two weeks ago, I wish i would have read this first. I was smitten with the addition of gelatin, chicken livers and cream but absolutely blown away with the fish sauce – would have never ever thought to add this! I guess in a way it replaces anchovies so it makes sense. I made a simplified version of Kenji’s recipe (using just beef and pork, didn’t have livers at the time) and even with some of the components removed, it was still INSANE. he uses fish sauce in a lot of his complicated food lab creations (like his chili) and I’m a total convert. I’m glad you tested this out! We have travelled to Italy and also became obsessed with this dish. I have worked over the years on finding an authentic recipe, and we have a great one the whole family loves (VERY similar to this one). The challenge we always face is consistency, in Italy the dish is thick and coats the noodles so well, it’s almost creamy… We have tried every option out there, nothing gets it quite right. I think the gelatin is the KEY!!! I am so stoked to come across this, I think I will be making a big batch this weekend! Thanks! How can I adjust the recipe to make in a crockpot instead? i would follow the instructions up until you put the sauce in the oven. put it in the crock pot on low. hope that helps. it might be a bit more liquid-y than if you do it in the oven because you’ll lose more moisture uncovered in the oven. Summer Session Old Fashioneds and a Giveaway!